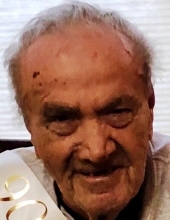 Joseph “Little Joe“ Pierri, March 23, 2019. Age 90. Devoted husband of the late Joan Pierri, nee Cerceo. Loving father of Joseph Pierri, Jina(late Mark) Pierri-Tietje, and Lara( Peter) Luetkehans. Best friend and partner of Laura Anderson. Cherished grandfather of Margaret Bozzano, Nicole Bozzano, Nicholas Pierri, Julianna Pierri, Joseph Luetkehans, William Luetkehans, Antonio Pierri, Eva Marie Grady, and Evon Luetkehans. Beloved father in law of Janet Arida. Fond uncle of many nieces and nephews. Joseph was the proud owner of Little Joe‘s Restaurant in Chicago‘s Marquette Park neighborhood. Funeral services Wednesday at 10:30 A.M. at the Petkus Lemont Funeral Home, 12401 S. Archer Ave.,(at Derby Rd.) , Lemont. To St. Patrick Church , Lemont, for Mass of Christian Burial at 11:00 A.M. Private entombment at St. Mary Cemetery, Evergreen Park, Il. In lieu of Flowers, Memorial Offerings in Joseph‘s name may be made to St. Jude Children‘s Hospital and will be deeply appreciated. Visitation Tuesday 3:00 to 8:00 P.M.
To send flowers or a remembrance gift to the family of Joseph Pierri, please visit our Tribute Store. "Email Address" would like to share the life celebration of Joseph Pierri. Click on the "link" to go to share a favorite memory or leave a condolence message for the family.